Installation is the key of any successful project regardless of materials, and it is especially true for higher end products like Tiles Couture’s. Always use an experience professional installer. IMPORTANT NOTE: Before installing any tiles, it is the responsibility of the installer to read and follow the manufacturer’s printed instructions. CLEAN: Make sure the concrete slab is clean and bond-able. COOL: Tile & slab must be moist when mortar applied. MOIST, do not saturated with water. that all corners and tile edges have a 100% bonding coverage. CURE: Allow to cure a minimum of 24 hours before grouting or subject to light traffic. 1- Pouring water on the slab & if it beads up, it has a ‘foreign’ substance on the surface. 2- Apply a solution of Phenol to slab, if it does not change color the surface may have contamination. 3- Install a test tile and remove it on the 3rd day. If the tile is difficult to remove, the slab is clean. NOTE: If there is indication of vapor transmission from concrete slab, consult with a mortar mfr. Light broom finished concrete slabs surfaces are required as ‘troweled smooth finished’ surfaces are always potential bonding problems. Must be cured for 28-days and ‘smooth finished’ surfaces should be mechanically abraded (grinding or shot-blasting) prior to installing tiles to ensure a bond. Carbonation of older concrete surfaces is a common form of environmental weathering. Eventually, it exposes aggregate due to the softening & erosion of the concrete paste formally surrounding the aggregate. Carbonation is caused by the absorption of carbon dioxide (air) & moisture into concrete forming carbonated water (acid), same as a typical soft drink. This chemical reaction weakens the concrete’s surface & must be removed prior to installing tiles. Must be allowed for when installing all floor tiles. Consult the TCA Handbook, EJ171 ‘Movement Joints’. Note: for interior installations, perimeter movement joints are mandatory. An important consideration for both exterior and interior concrete tile installations. For details consult the TCA handbook, ANSI, CTIOA field report, CTMA field report & technical bulletin. THIN-SET: Method normally preferred by C-54 tile installers when installing ceramic tiles. 1- Always first review and then follow the instructions printed on each bag of thin-set. 2- Mix the thin-set and clean cool water (or latex additive) together by hand or use a variable-speed electric drill at slow speed (150 to 200 rpm) to a smooth, paste consistency. Let slake or stand 5 -10 minutes, stir again and use. Stir occasionally to keep fluffy, BUT DO NOT RETEMPER (add more water). When properly mixed, troweled ridges on slab will stand with little or no slump. 3- To avoid entraining air in the mix, use a Bird Cage rather than a Paddle mixing attachment. 4- Spread thin-set with the trowel’s flat side to skin the substrate and break the ‘surface tension’. 5- Run grooves in one direction under each individual tile, which allows air to escape. 6- Hold the ½” square notched trowel in a near vertical position and finish combing in one direction. 7- Do not allow thin-set to `skin-over’ as that will inhibit bonding of the tile. 8- Backbuttering each tile is recommended in all applications; however, on exterior applications with tiles 8″x 8″ or larger, It is mandatory to obtain a minimum of 95% coverage! Thin-set should be spread onto the back of individual tiles with the flat side of the trowel. 1- Ideal for setting concrete tiles and large formatted tiles. 2- Typically used with a ½” x ½” x ½” square notch or ¾” rounded notch trowel. 3- Most can be used from 1/8″ thick to ¾” thick after tiles are beaten into place. 4- Most are formulated with additional larger sand gradation to minimize shrinkage. 5- Available in white and gray, modified and non-modified, normal set and fast set. 6- Spread mortar and set concrete tiles in the same basic way as a ceramic tile or natural stone. 7- Backbuttering tiles on the interior recommended, It is mandatory on exterior applications. MORTAR-SET: Method preferred by C-8 masonry contractors. IMPORTANT NOTE: This method not recommended by all concrete tile manufacturers. 1- Available in bags premixed dry or can be mixed on job sites. When mixed on site, use 2½ to 3 parts washed plaster sand to 1 part Portland cement. Use of latex & acrylic concrete additives is strongly recommended. Mortar too rich with cement has a tendency to shrink and crack. 2- Mortar-Set application can be used at a minimum of ½” thick to a maximum of 1″ thick. 3- Do not allow mortar to lose plasticity and become stiff, as that will inhibit bonding of the tile. 4- Extreme hot or cold weather affects the mortar’s open time. Consider both the air & slabs’ temperature & do not spread too much at one time, as heat affects open time. 5- It is recommended to slurry coat (backbutter) the back of each individual tile for all applications; however, on exterior applications with tiles 8″x 8″ or larger, it is mandatory! This ensures ultimate bonding through wet-to-wet mortar contact. 6- Do not use a rubber mallet directly on tile. Instead use beating block to adjust tile if needed. 1- Extreme hot or cold weather affects the thin-sets’ open time. Always check first the instructions printed on the thin-set sack or package mortars regarding temperature & open time. 2- Press tiles into grooved thin-set or mortar bed, moving back and forth to level and ensure a complete bond. If necessary, use a beating block to adjust the tile. 3- Under no circumstances allow voids in the thin set or mortar set at the corners or edges of the tiles. If that occurs, it will contribute both to the tiles debonding and cracks in the grout joints. 1- Clean any thin-set or mortar off the face of the tiles ASAP, as the longer it stays on the more difficult it becomes to clean off the tile’s surface. The length of time you will be able to do this varies with the concrete tile’s surface temperature. 2- Never leave a ‘cement haze’ on the concrete tile’s surface overnight which is often done when installing ceramic tiles, because you will be unable to remove it the next day. 3- NEVER USE ACIDS when cleaning concrete tiles or grout, as they will detrimentally affect the colors and finish FOREVER! Although less forgiving, SPREAD (SMEAR) GROUTING IS PREFERRED BY SOME TRADES. 1- All materials must meet & exceed industry standards as tested according to ASTM. 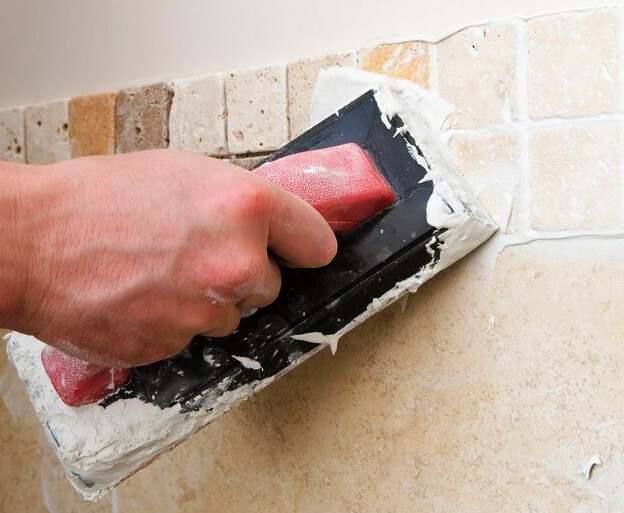 2- Thin-Set or mortar-set residue must be cleaned off each tile’s surface prior to grouting. your own grout, use a mixed gradation of 30/60/90 silica sand in a 2 to 2-½ ratio to 1 cement. 4- Do not use excessive water, because if you do the grout will then shrink away from the tile’s edge. Allow to slake (stand) for five to ten minutes, then restir. 5- Depending on temperature, pot life of mixed grout is approximately two hours. Never retemper! 6- All grout residue must be completely cleaned off the concrete tile’s surface before its final set. Before leaving a job site, all grout scum or haze must be removed as it will not come off later. 7- DO NOT UNDER ANY CIRCUMSTANCES USE ACID TO CLEAN TILE AFTER GROUTING. BAG GROUTING: Method preferred by C-8 masonry contractors. 1- Fill grout bag with grout mixture between 1/2 to 2/3 full. 2- Grout should flow through the bag smoothly with a creamy consistency. If not, add cement. 3- Twist the grout bag until all the slack is taken up and then continue to roll the bag tighter to maintain a constant & consistent pressure. If water drips out of the nozzle, add cement. 4- Use one hand to keep the bag twisted at the top; with the other hand, squeeze bottom of bag while pressing your knuckles into the bag at the top. Maintain consistent pressure. 5- Force enough grout into each joint to completely fill it higher than the tile’s surface. 6- When grout starts to set up, tool the joint to compact the grout and remove excess. 7- The main advantage of Bag Grouting is clean up can be done without using water. Spots can be removed by lightly rubbing the surface with steel wool or with a soft wire brush. SPREAD (smear) GROUTING: Method preferred by C-54 tile contractors. EXCEPTION: DO NOT SPREAD GROUT ON TEXTURED SURFACES. 1- Installation according to ANSI A-108 & TCA Handbook. Materials meet ANSI A-118. 2- Press grout into joints with a rubber float held at approximately 45º, completely filling all joints. 3- Do not spread grout on a larger area than you can easily clean prior to losing it’s plasticity. 4- Do not use too much water on the tile’s surface during cleanup as it will weaken the grout. 5- Replace cleanup water frequently to ensure complete removal of all grout scum. DAMP CURING THE COMPLETE INSTALLATION WHEN FINISHED IS HIGHLY RECOMMENDED! This will slow the hydration process and minimize grout shrinking away from the tile or cracks in grout. After the installation has been completed and cured, the tiles should be sealed with a breathable sealer. This should be done whether it has been initially sealed or not to protect the grout. Concrete tiles are a very durable product; however, they need maintenance like all other floor coverings. Concrete tiles, although very dense and durable, are similar to unglazed ceramic paver tiles. Both need to be sealed to protect them from staining and preserve their original appearance. Several factors influence the selection of the appropriate sealer that will provide both the look you desire and the performance you expect. The following are important points to consider to ensure obtaining the best results. FIRST: QUALIFY THE CONCRETE TILE YOU WISH TO SEAL. 1- Is it a new tile installation or are you refurbishing an existing installation? a- If it is a new installation, continue on this page. b- If it is an existing installation to be refurbished, refer to PART VI – Maintenance. b- Pour a small amount of water on the tile. If it soaks in and turns dark, it has not been sealed. If it beads up, does not soak in or turn dark, it has been sealed. 3- If it has been sealed, it is very important to find out what type of sealer was used. 4- If not pre-sealed, before grouting it is recommended that the tile be sealed with the same sealer you have selected for the finish coat. This eases cleanup and minimizes potential staining. SECOND: CONSIDER LOCATION OF THE TILE INSTALLATION AND THE TYPE OF SUBSTRATE AS BOTH WILL INFLUENCE CHOICE OF SEALERS AND ROUTINE MAINTENANCE REQUIREMENTS. 1- Is it an interior or exterior application? 2- Is it subject to residential or commercial traffic? 3- The substrate is only a factor when concrete is poured ‘on grade’ in an area that is subject to excessive moisture. Under these conditions, be sure the sealer is breathable. 4- Is the tiled area subject to water on the surface causing potential slip/fall problems? 5- Do you need to also stop grease & oil penetration (food areas, driveways, etc.)? Not all penetrating sealers resist grease and oil. Read the label and if still in doubt, call the manufacturer. NOTE: There are solutions and methods to handle all of these issues: however, choosing the correct sealer is a key factor in avoiding these potential problems. Penetrating Sealers work below the surface leaving no film or appearance change. Option #1.Coating Sealers leave a clear film on the surface producing options #2 through #4 listed below. 1- NATURAL LOOK – Use a ‘Penetrating‘ sealer. 2- LOW TO MEDIUM SHEEN – Use a ‘Coating‘ type of sealer. 3- HIGH SHEEN – Use a ‘Coating‘ type of sealer. 4- WET LOOK (darkens tile) - Use a ‘Coating‘ type of sealer. NOTE: For interior applications, a polish or wax will provide additional gloss and protection. FOURTH: THE CONCRETE TILE’S SURFACE MUST BE CLEAN AND DRY BEFORE SEALING. 1- Any discoloration on the tile’s surface will be permanently locked in unless removed. 2- Remove any residue and grout haze before sealing. FIFTH: LIKE ANY FLOOR FINISH, PROPER FLOOR MAINTENANCE IS VERY IMPORTANT. Grout Residue (cement grout) Easiest clean-up is achieved by following grout manufacturer’s recommendations and removing all residues from tile/stone surface before grout is allowed to cure. (1) Always read directions thoroughly before using product. (2) Always do a small test area to ensure desired results. (3) Call product manufacturer when in doubt. Use: (a) gel-type stripper, (b) paint, varnish, sealer remover or (c) poultice. Apply stripper or poultice paste to stained area. Repeat process if necessary. Use: Alkaline (ammoniated-type cleaners). Repeat process may be necessary for heavy build-up. Use: (a) gel-type stripper, or (b) paint, varnish, sealer remover (non-flammable). For some sealers or multiple coats of sealers, repeating removal process may be required. Contact product manufacturer. If efflorescence is under sealer, the sealer finish may need to be removed. Do not allow stripper to puddle or dwell on grout joints. For areas that have been neglected or do not respond to routine maintenance and neutral cleaners, use of an alkaline cleaner (high pH) is recommended. A scrub brush will aid in this process, especially with textured surfaces. Always sample a small section first. Will remove wax-type floor finishes. Use a neutral cleaner (pH 7.0) for routine cleaning of concrete tile. Follow product label directions for best results. Sweep or vacuum floor frequently to remove dirt and loose soil. Promptly wipe up any spills to minimize risk of staining. the amount of solution used on floor, damp mop and dry promptly for best results.